There will be a number of clean-ups around the City! We urge you to join in and find your friends in the neighbourhood! If you would like to find a clean-up nearby check out Cleaning up the Capital. Some Community Network teams are organizing clean-ups, join our Ecology Ottawa teams if you have some time! Followed by a look & discussion of City’s Chamberlain Park Tree Replanting Plan (12-1:30) This is the park at Lyon & Chamberlain with the soccer field & tennis courts. The park is losing about a dozen ash trees to the emerald ash borer. Sawmill Creek Clean-up The cleanup was held on the April 27th rain date, making our participation a bit thinner than we had hoped for. However, it was sunny and our solid team of seven worked for 2 hours. We collected around 12 bags of garbage, chatted with some workers at the adjacent businesses about their spring clean-up efforts. Interesting bits of garbage included a mangled garden hose, 20 or so packets of underlivered flyers, lumber, plumbing fixtures, hub caps and every type of plastic packaging you could imagine. Stay tuned for a fall clean-up and some grounds maintenance this summer. It is a beautiful green space and coming out to clean-ups is a great way to see it! 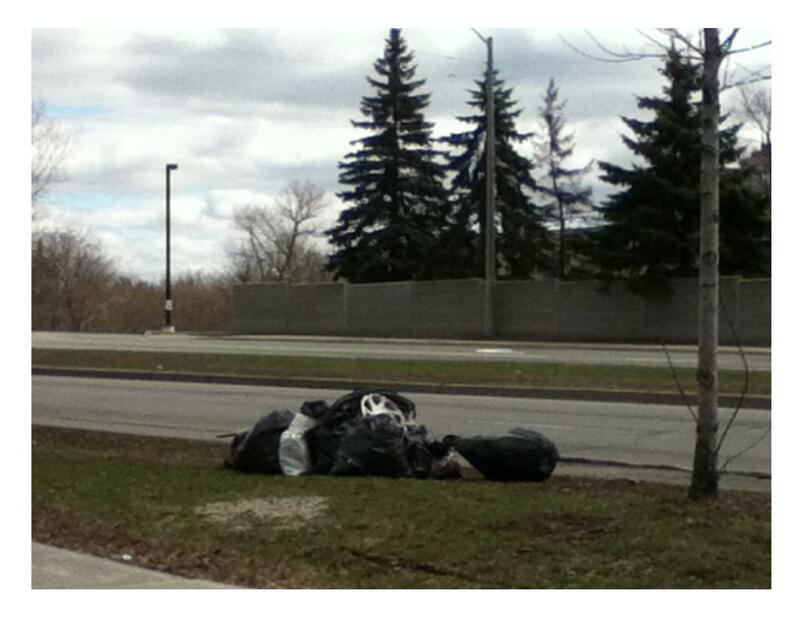 Garbage from Sawmill Creek waits for pick up! 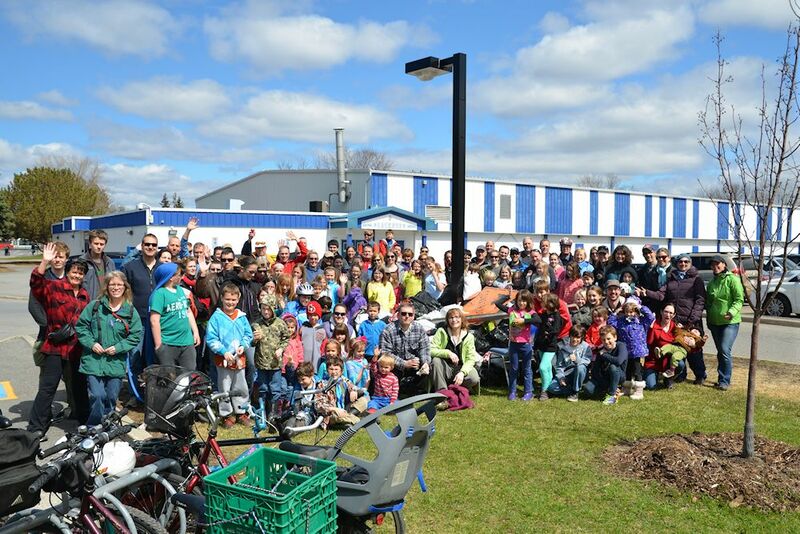 Our 14th annual Blackburn Spring Clean-up was a huge success this year. Held on the rain date, Sunday April 27, we had 160 Blackburn residents come and pitch in for the community event, along with about 20 loyal volunteers who help us each year. In total we collected more than 100 bags of litter, as well as an assortment of interesting “treasures” such as bicycles, construction signs and office chairs. It was a smashing success – thanks to all who participated! This annual community event is only made possible by the support given so generously by others. In addition to all the residents that rolled up their sleeves to pitch in this year, there are a few individuals that should be thanked for the support that we count on each year in planning this event. In particular, a big thank you goes out to Shelley Seward-White and her team at the local Tim Horton’s for providing coffee, hot chocolate and timbits for all the volunteers. Also thanks goes out to Lynn Leduc for organizing her trusty BBQ crew and her dad Ken McEwen for donating his time and truck to circulate the neighbourhood picking up the leftover garbage bags. Each year Paula Rosenquist, BCA Environment Director, helps at the registration desk sending people off to locations throughout the Hamlet, and we are glad to have her help! Finally, a big thank you is extended to Councilor Rainer Bloess. This was his last Spring Clean-up “gig” in his current position. We have really been grateful for his support and prizes generously donated over all these years. We’ll miss his booming voice and his team spirit – but hope to recruit his assistance in the years ahead. Thanks Rainer!